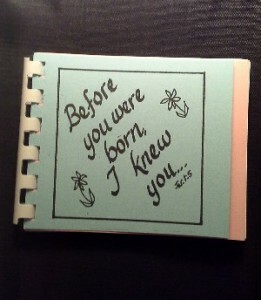 In February 2014 ‘Before You Were Born’, a prayer packet that the Missionaries of the Liturgy have given to expectant mothers for over a dozen years, received a new format. Previously prayers were tucked in pink and blue envelopes tied together with pink and blue cord. It was very clever, but very putsy to make and I could never finish many at a time. In February I worked on a new format, a simple booklet form and those booklets are now ready to distribute. They are still a lot of work to put together. 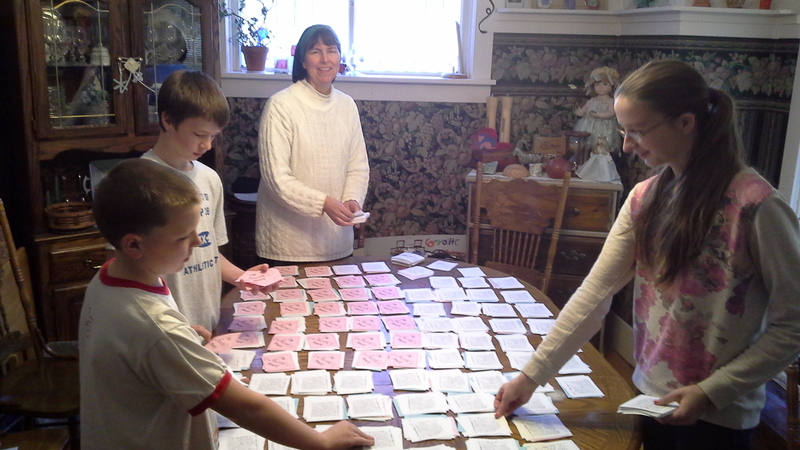 The first 75 booklets were assembled by Servant Maria with the help of the Pillifant Family of Ishpeming. (Below you can see us working.) Now that the Holy Store in Iron Mountain is open and we have very few customers, Evelyn works hard assembling the booklets at the store. You can order your booklet online, or stop at one of our stores to purchase them. They are just $2.99. There are four or five prayers for each of the nine months of the baby’s development. P.S. The very baby that got me working more quickly on ‘Before You Were Born” in the year 2000 is to the left of me in this picture. His mother informed me she was expecting and, although the idea for the booklet had already been in my head, when I knew a baby was coming, I worked faster to get the booklet finished and to my good friend Melissa before too many months went by!